I wanted to write a bit today on my reflections based upon my very hurt feelings yesterday. I'm not going to get into any specifics, but reflection upon hurtful things in life, and consequent lessons learned, is a good thing, and I wanted to share that with all of you. I am a person who gets her feelings hurt very easily. I so, SO wish that I could change this about myself, gentle reader, but as many of you also likely know, this is simply not possible. And so, through the years, I've tried very hard to just deal with hurt feelings better and not carry the wound with me so long. Things have improved somewhat with age and wisdom, but the underlying condition remains. This is the personality God blessed me with, and so I do my best with it. Here are a few of the things I reflected on last night: When we are hurt, God wants us to ask Him for His help. We may be feeling too cranky to ask, but we must. Prayer, even when it feels utterly devoid of inspiration or emotion, is *still* beneficial to our souls. It will help, even if it doesn't feel that way right at that moment. Also, God is trying to show us something valuable and beautiful even in spirit crushing situations. Painful circumstances are not something to merely endure, but to look more widely at what positives we can learn and take away from them. There is *always* going to be more to learn. I also thought about Pope Francis yesterday. I very much love and admire Pope Francis, but I hadn't yet forged an emotional bond to him the way I had with John Paul II, and even Benedict XVI. His style is very different from theirs, and so I didn't know if I'd ever have those same feelings for him, although his guidance of the Church right now is so top notch. But yesterday, I thought about him, do you want to know why? Because I knew that he would have the words to soothe me, as any good Shepherd would. One of the things he has said recently that the media latched onto was very applicable to why I was feeling so poorly yesterday. It made me appreciate him anew, and realize that I shouldn't only wait for him to start talking about liturgy or detailed theology to get interested in what he has to say. I may be particularly interested in those two topics, but he has something to offer that is just as fascinating and just as good. I'm so appreciative for the opportunity to have realized this. I knew that a good night of sleep was paramount to my spirits bouncing back today, and that is what happened. That, and some support and encouragement from very dear and wise friends who are such a blessing to me. I thank God for them. And so here I am today, trying to get my bearings again. This has always been a "life blog, " as evidenced by the title, and I'm certain that different people read my blog for different reasons. First of all, thank you to you ALL for even reading, I can't tell you how much that means to me. A writer loves an audience, to be sure. But my blog is somewhat different from other blogs that I read because it doesn't focus on any one "theme," if you will. It's certainly a Catholic blog, but I write about my whole life, and so there's a lot more in there, like my description indicates. I write about parenting, I write about dancing, I write about crafting, I write about marriage, I write about being a librarian, and sometimes I just write about things that I find funny, because my aim is always to be a lighthearted and humorous writer. I am a belly dancer. You may notice that I changed the header on this blog to read "Middle Eastern dancer." I did that for a reason. I don't want people to be put off by the word "belly" and then never give me a chance to explain how this form of dance is not in any way inherently inappropriate. This is a part of my life that I love and enjoy, and I'm not going to stop writing about it. I do, however, hope that people will not see the header and immediately judge that I am therefore beneath them and not worthy of their time. I am a mother to small children who works full-time outside the home. Our son attended daycare from the time he was 10 weeks old until he went to kindergarten at age 4. I do not homeschool. I have absolutely zero problem with homeschooling, but I do not feel that I would be very good at it. Therefore, my school aged son goes to our parish school. I nursed both my babies, but I did not do it exclusively and I did not practice attachment parenting. I am married to a baptized Catholic who now considers himself an atheist. I have 2 beautiful children, a boy and a girl, who are five years apart in age. It would be very easy to look at the birthday tickers at the top of this blog and judge that my husband and I use artificial contraception. That would be utterly incorrect, but that's what happens when one lets surface facts lead to condemnation without looking any deeper into the matter whatsoever. See "I am a belly dancer," above. And of course, the list could go on and on. The fact of the matter is, no matter WHAT choices we make, someone will judge us for them. It's a fact of life, and as a blogger, it's certainly a fact of putting myself "out there." I understand and accept this, and I'm dealing with it as best I can. I make myself vulnerable by maintaining this blog. Some people appreciate that and are loyal readers who enjoy my writing. Others take advantage of that and use their words as weapons. I am very sorry for that. But I am NOT going to judge that person or persons in return. They may be having a bad day. They may be having a bad month. They may think that they are being charitable by pointing out what they see as my sinful behavior and are concerned for my soul. I hope that they will give me a chance to explain, but I cannot force them to. They may hurt me, but I'm not going to lash back. I'm just going to go about my business, blogging like usual. Because I love blogging. And I love blogging about all of the things that make this blog, and this woman, unique. I hope that you and I, dear reader, will have a long and happy future together as we journey along this thing called life. It's not always easy (especially when you have suffered through reading this entire post. :0 Your sacrifice has been duly noted...) but we do our best. Tiffany, I have been reading your blog for about a year now, since I was trying to decide whether I would like to be a librarian! I enjoy a number of Catholic Mom blogs, but find yours to be unique because you are a working Catholic Mom...like me! I think its a perspective that is needed because some women are called by God to work outside of the home. This doesn't make us any less as parents, but in the Catholic community it can feel a little lonely. Your blog and perspective as a dedicated Catholic working outside the home has helped me feel a little less alone. Thanks for writing and I will surely continue to follow you! Hi Barbara! Thanks SO much for writing in! It's so fascinating to find out how people find me, and why they continue reading. And I agree with you. 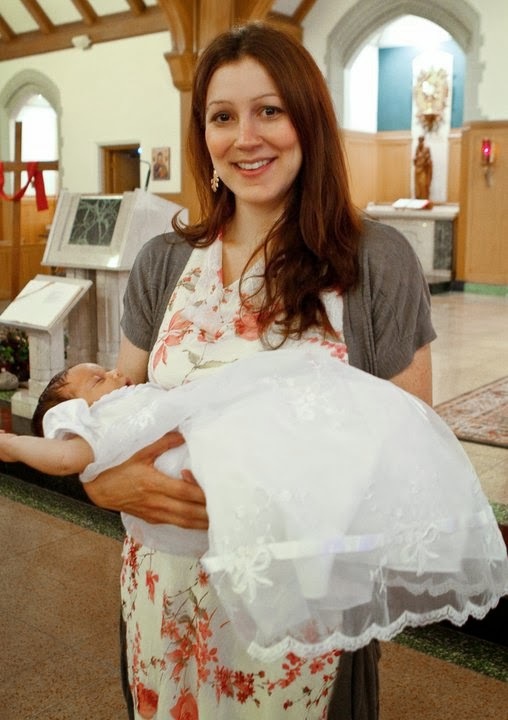 I know a lot of SAHM Catholics, and read their blogs :) and love them. But it's always nice to also have friends whose situation is the same as yours. *Definitely* makes you feel less lonely! We're in this together! Oh, Tiffany, I will be praying for you. Life is VERY hard, sometimes, and it is so easy to forget how powerful our Enemy is. But "We have allies who are more than a match for our adversaries." And I do have to add one very tech (yet cool) comment about dimensions. You know how everyone likes to yak about space and multi-dimensions and all that. It's quite silly, sometimes, though permissible while it is kept to its proper place in the fantastic and fiction. (I ought to know, having written a bit.) But I do want to point out the REAL truth about dimensions. I forget if it is really from some old Sci-Fi book (or movie) or something I learned at school, but it hardly matters, since it is TRUE. "Space has as many dimensions as you need in order to solve the problem at hand." I have seen an equation in SEVEN dimensions, a real and practical one. There is NOTHING ODD about it. Even though Seven is an odd number, hee hee. Anyway, my prayers are with you & your family - and I am grateful for yours. Sometime drop me an e-mail. Pete, thank you SO MUCH for your kind words, and your prayers! If I was up North, I'd be working too. And once Christopher is back in later Middle School, he will, most likely be back in school. I miss working. I miss interacting with adults. But my child has special needs that public school couldn't meet (I'll tell you privately). And for now - I'm home. I just turned 50 and as you know -I am terribly imperfect. And I'm here to tell you there are a zillion right ways to parent and right ways to walk your path to the Lord. Lady - your are beautiful. You are smart. You answer to and only have to please our Lord. And you do not owe ANYONE an explanation. Stepping off my box now.